WINGATE -Call them the Road Warriors. 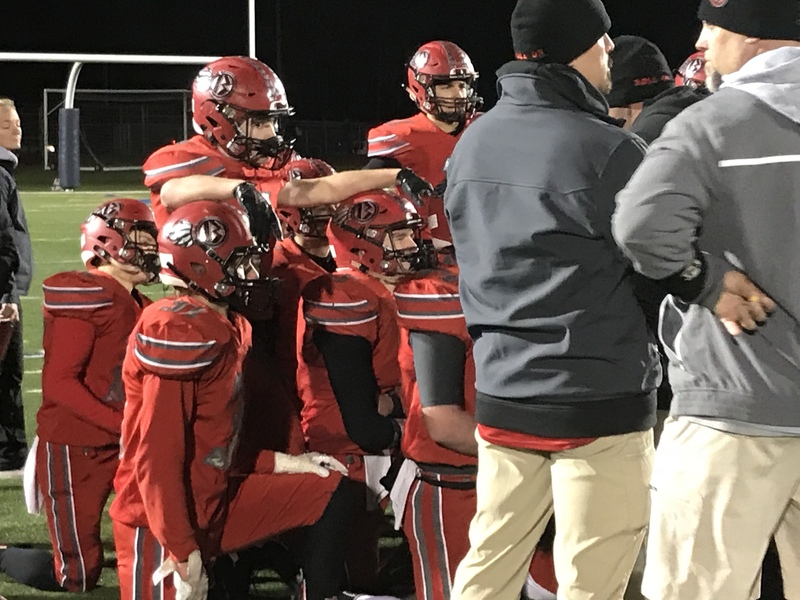 After having just one home game all season, the Bellefonte Red Raider football team has been very successful playing on the road, posting a 9-2 record. In their opening playoff game, the Red Raiders once again playing on the road, this time at Bald Eagle’s Alumni Stadium against Bradford. Bellefonte overpowered the Owls as its offense cranked out 58 points in a 58-18 dominating contest. CJ Funk and Kyle Myers followed their blockers the entire game, finishing with a 112-and 103-yard rushing day, respectively. Bellefonte dominated the line of scrimmage on offense and defense as the Red Raiders stormed through the contest with 422 total yards while the defense held Bradford to just 224. The Owls only were able to manage just 11yards through the air. Even in the special teams department, Bellefonte was able score on a Noah Badger kick return and a Funk punt return. Things didn’t start quite the way the Red Raiders had hoped as Bradford’s Zach Cole took the opening kick off and ran it 87 yards to the Bellefonte five. Teammate Donny Pattison cashed it in from five yards out, making it 6-0 with still 11:03 on the clock. On the following kick off to the Red Raiders fumbled the kick , giving Bradford the ball deep in Bellefonte territory. Six plays later, Pattison scored again to increase the Owls’ lead to 12-0. Bellefonte seemed unphased as it finally went on offense. They went right at the heart of the Bradford defense. The “Red and Black Attack” rolled down the field, getting it to the eight where it went to Chris Persiko to kick the field goal. Persiko was automatic and put the Red Raiders on the board, trailing 12-3. Bradford’s third possession, the Owls tossed an interception to Nicholas Catalano giving the ball back to the Red Raiders on the Owls’ 32. Six plays later, Funk muscled it in from four yards out, cutting the Bradford lead to 12-10 with 32 ticks left on the first quarter clock. From there, the Bellefonte defense clamped down even harder as it once again stopped Bradford I it’s tracks, forcing a punt. Going right at the heart of the defense, the Bellefonte offense kept churning yard after yard until it faced a 2-and-5 from the three. Quarterback Myers called his own number, putting the Red Raiders ahead 17-12. Another Bradford possession and another punt to the sizzling hot offensive unit. Funk showed his speed as he caught a punt on the 18-yard line and blazed a trail downfield, scoring an 82-yard punt return for a touchdown. With the PAT, the Raiders were now in charge leading 24-12. Bellefonte wasn’t done yet. It would score one last time before the intermission. With 15 seconds left, Funk got the call once again, scoring from three yards out, leading 31-12. Noah Badger got the Red Raiders second half off and running as he took a squib kick and went right up the sidelines for the 60-yard kickoff return, upping the lead to 38-12. From there, the Red Raiders got a score from Funk and Myers and finally Logan Houser to take a 58-12 advantage into the final minutes. Bradford scores late in the fourth, ending the scoring at 58-18 but most importantly sending the Red Raiders to a Championship game against Clearfield next week.